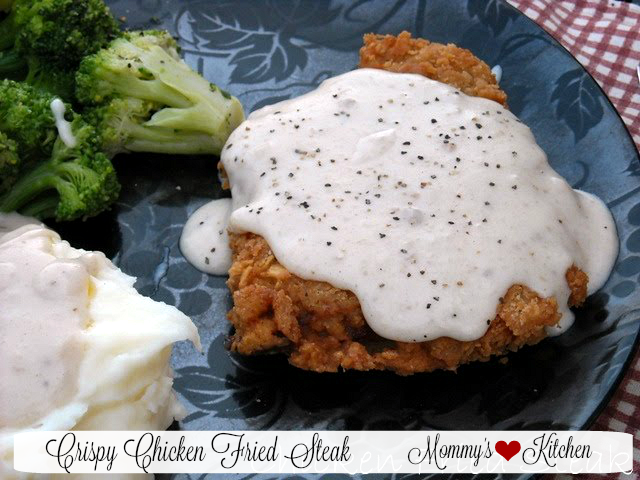 Texas Style Chicken Fried Steak with Cream Gravy. Classic Chicken Fried Steak is breaded steak that's pan fried until crisp and served with homemade cream gravy. Hi everyone!! I had every intention of getting this recipe posted yesterday, but as usual time got away from me. We're still painting our kitchen cabinets, so that has been very time consuming. My kitchen looks like a tornado has passed through it, but it will be all worth it in the end. Today I want to share a recipe for Chicken Fried Steak or Country Fried Steak depending on where you live. Chicken Fried Steak is made using tenderized cubed steak that has been dredged in flour and egg, and then fried like fried chicken. Serve with a big smothering of cream gravy made from the pan drippings and mashed potatoes on the side. "Yum" it doesn't get much better than that. Chicken Fried Steak is also one of my husband's favorite meals, so anytime we go out for dinner that's usually what he orders. During the meal he tells me the same thing every time........"You need to make chicken fried steak at home". And my answer is the same every time... I know I do, but I can never seem to find a breading that sticks to the steak. Plus I don't care for cube steak, because it can tend to be stringy when cooked. For that reasoning chicken fried steak is something I usually don't prepare at home. Well I'm happy to say that I've solved both problems and we can now enjoy this classic dish at home. Who do I have to thank for this? Well that's simple...... myself and Mr. Walmart Man! I was in Walmart the other day and I always make a to stop by their meat department and look for specials. You see Tuesdays is the day at my local Walmart when meat is marked down, so I always stop and check it out. We have a very nice gentlemen that works in our meat department, so I always stop to say hi and chat with him. I happened to see that he was marking down thin rib eye steaks, so I was all over that. We got to chatting as usual and he told me use those thin rib eye steaks and make the best chicken fried steak ever. I told him making chicken fried steak has been a big dilemma for me. Mr. Wal-mart Man said trust me on this one thin rib eye steaks make the best chicken fried steak, and proceeded to hand me a couple packages of marked down steaks. He said try it and let me know how it goes. Well this is where I come in. I had the meat issue resolved, but I still had the problem of the breading not sticking to the meat. I kept thinking how could I get that breading to stay on those steaks and still fry up crispy? Then it dawned on me just use the same recipe that I use to make Chicken Fried Chicken. Of course!!!!!! and why didn't I think of this sooner? Well that question can easily be answered by saying "sometimes I'm just slow like that" LOL. I used the same recipe, cut the ingredients by half and got started. I cut up the meat in serving size pieces, gathered my breading ingredients, and off I went. I dredged, dipped, and fried up all those thin rib eye steaks. Then the waiting began...... I flipped them over and the breading stuck. Yay!!!!!! They were also very crispy and golden brown. This happens to be my favorite chicken fried chicken breading so I was excited it all worked out. I think the added saltine crackers to the breading are the secret, because the steaks fry up so crispy. So now we are finally enjoying Chicken Fried Steak at home!!!!!! All I can say is "Thank You Mr. Walmart Man" and I promise the next time I see you I will ask you what your name is. Here are the rib eye steaks and the great deal I got on them. Thin cut chuck eye steaks can also be used. Cut the steaks into smaller size portions. There is also no need to pound or to tenderize the steaks. Again Mr. Walmart man said there was no need for that. In a medium size bowl combine cracker crumbs, flour, baking powder, salt, black pepper, and ground red pepper (if using). In a second bowl, whisk together the milk and eggs. Dredge the steak pieces in the cracker crumb mixture, and then dip in the milk mixture, and dredge in the cracker mixture again. I lay my steaks out on a baking rack until I have breaded all the steaks. Pour oil to a depth of 1/2 inch in a 12-inch skillet or cast iron skillet. Heat oil to 360°. Fry steaks in batches, about 10 minutes, adding oil as needed. Turn and fry a couple more minutes or until golden brown. Remove to a wire rack that has been place inside of a jellyroll pan. Place pan in a 225 degree oven to keep warm until you have fried all of the steaks. Yum these were so good and look at how great the breading stayed on the steaks. Perfection! Serve with mashed potatoes and cream gravy (recipe below). In a medium size bowl combine cracker crumbs, flour, baking powder, salt, black pepper, and ground red pepper (if using). In a second bowl whisk together the milk and both eggs. Dredge the steak pieces in the cracker crumb mixture; dip in milk mixture, and dredge back again in cracker mixture. Set aside on a baking rack or plate. Pour oil to a depth of 1/2 inch in a 12-inch regular or cast iron skillet.. Heat oil to 360° (Make sure the oil does not smoke, because that's too hot). Fry steaks in batches, about 10 minutes, adding oil as needed. Turn and fry a couple more minutes or until golden brown. Remove to a wire rack that has been place inside of a jellyroll pan. Place pan in the oven to keep the steaks warm at 225° degrees. Carefully drain the hot drippings, reserving cooked bits and 2 -3 tablespoons of the drippings in skillet to make the cream gravy. Add 1/3 cup flour to the skillet with the drippings. Cook over medium high heat. Using a whisk mix the flour into the drippings until it starts to brown and become a roux (a darkened paste). If the roux looks too oily and runny you can add another tablespoon or so of flour and mix again. Whisk constantly until the paste becomes nice and brown. Slowly add the milk and water mixture one cup at a time (to ensure a smooth gravy) whisking constantly and blending the liquid with the flour mixture until combined. Add the rest of the milk milk mixture as soon as is starts to thicken up and whisk again. Let the gravy come to a boil and then reduce heat to a simmer. Simmer until the gravy thickens up. If the mixture thickens to much add more milk (as needed ) until the gravy is the consistency that you want. This could end up being more then the required 3 cups of liquid. Season generously with salt and pepper. Serve the cream gravy over over the chicken fried steak and mashed potatoes. If using salted crackers decrease the salt to 1/2 teaspoon or omit from the recipe. This is also a great breading for deer steaks as well. A splash of tabasco sauce can also be added to the wet batter, but that is optional. There has been a big debate that this recipe is not an authentic chicken fried steak, because it's not fried in lard or in a cast iron skillet. I totally agree with the cast iron part, but not the lard. True that is how chicken fried steak is fried, but it's not healthy using lard to fry foods. Yummy!! We love ribeyes and we love chicken fried steak but I have never tried making chicken fried steak with ribeyes!!! I can't wait to try this!! Thanks!! I know isn't it crazy. I was so surprised when he suggested it, but I was at my wits end trying to find a cut of meat I liked. Who would of known to use thin rib eye steaks. It looks delicious! We love CFS and I haven't made it in ages but will have to now! Good job with the ribeyes! Yummy!!! Glad you found what works for you. WE love chicken fried steak, but never have used rib eyes for it. We have used round steak, tenderized and done just like you did, to fry it up! 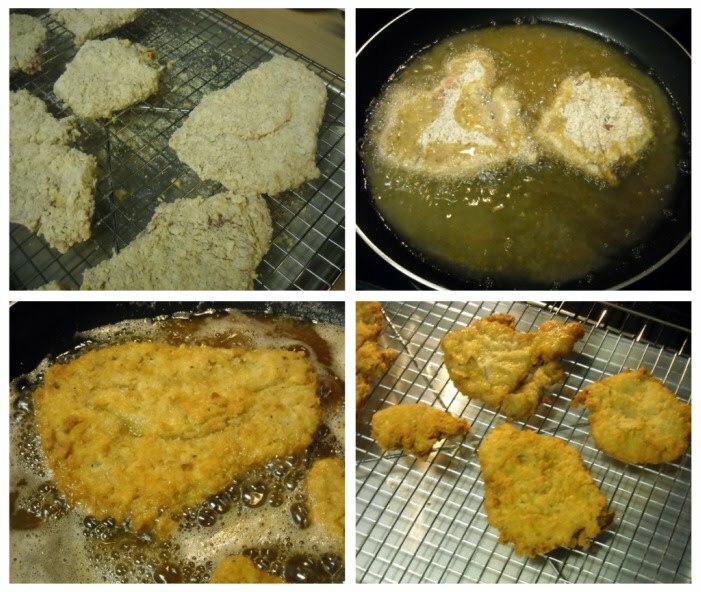 The cracker and flour mixture is really great on fried pork chops too! CFS is my favorite dish! It makes me miss Texas more than anything! Thanks for sharing a recipe that you can make with rib eye-that's a great idea! This looks really yummy! We aren't usually fans of fried steak, but maybe using the different cut would make the difference as well as the breading. I am really glad you posted this! I've made CFS in the past with cube steak and like you said, it's always tough and stringy. So I've just been sitting back waiting for an alternative meat to make it again. Oh my goodness I'm so happy you posted this because just this past Sunday night I made your Chicken Fried Chicken recipe and my search is also now over! It was awesome! I really think its the cracker crumbs and now this Sunday I will probably be making the same thing just Chicken Fried Steak! Thanks again! Oh and my husband made his very first dessert EVER and it was your Blackberry Cobbler. I was so proud of him! Haha! Comfort food at it's finest!! I would never have thought of using ribeyes!! Wal-mart man gets big kudos from me! That breading looks great too. I'll have to try it for my chicken fried pork chops. I haven't fried anything in ages, even though I was raised in the south, but had a hankerin' for them last week. The breading fell right off. :-( I was seriously bummed! I loved Chicken Fried Steak! I ate it all the time when I lived in San Antonio. Not too many places here in S. Florida make it (or at least not great tasting). i will have to try this recipe. It's one of my son's favorite foods. I don't eat beef, but this looks absolutely delicious! Kirby that is awesome and I am so proud of your husband as well. Blackberry cobbler nice choice. Louanne, Mr Wal-Mart man is awesome in my book. My husband and boys have been bugging me to make Chicken Fried Chicken. I've made it twice before using your recipe, it's probably their most favorite meal! I was so happy to see the recipe for CFS, I'm sure they will love this also. Thank you so much! Novice cook here. What's the reason for not using a non-stick pan. Your photo looks like you used one. Ya know I dont know why. 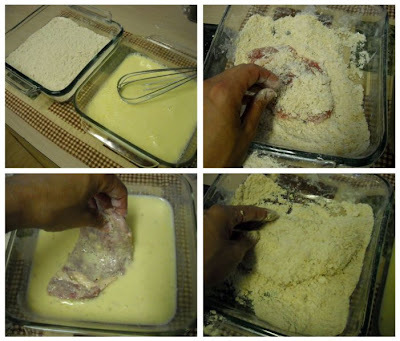 The chicken fried chicken recipe (Southern Liv. )recipe states not to use a non stick pan. Your right and I always use non stick. Who knows, guess I need to take that part off because I dont see that it really matters. I've only ever made these w/ cube steaks. I am going to have to give this idea a try. That looks yum-meeee! And this is one recipe I haven't made in years. Thanks for the reminder. Going to try yours. Thank you for sharing this - I'm about to make my Wal-Mart list now. I never thought about using ribeyes. Let us know if you come across another usefull alternative like this - beef today is sometime so hard to cook with. I have totally had the same fear and have NEVER made it. Now . . . I don't have an excuse. Thanks! My husband loves chicken friend steak and it is one of the few dishes that he really knows how to cook well. The kitchen is usually a disaster when he is done, but the food is good! He says that when he was a kid his father made it 2-3 times a week. I am surprised he survived to adulthood eating that much chicken friend steak! Tonight was my 1st time EVER making or eating CF Steak but my hubby's been asking for it. Needless to say - DELICIOUS! Easy to follow directioms and yummy, too! ROCK ON! Hello! I made this for dinner last night. Well, I didn't get then rib eyes, cause call us crazy we like the chewy cube steaks. The breading and gravy though was outstanding and DH announce this recipe is a keeper. Looks great! When I make chicken fried steak it never quite turns out the way I think it's supposed to, so I will definitely be trying out this recipe! I was very curious after reading your email about using the thin rib-eyes. I bought the steaks and made this last night! OMG!! So good and the only thing I did different was to add to onion and garlic powder to my cracker crumbs. Thank you for sharing! I'm so glad you posted this! My husband and I were just talking about having those, and I was wondering if ribeyes would work. I can't wait to try these (I'm dreading the extra time on the treadmill, though!). I made this a few days ago except I used thin sirloins instead of the ribeyes and it was AWESOME!! Both of my kids loved it which rarely happens. Thank you!! maylee linderberry-it was very yummy my whole family loved it!!!!!!!!! Thank you Thank you . I will soon try this, that was always my problem too with breading falling off.... Cant wait to try it..
Hi, I love this recipe but I have a question for the gravy what do you mean by dripping where did you get them from...sorry!! Hi, the drippings are the grease & crunchy batter bits that are left on the bottom of the pan after frying the chicken pieces. I made this with thin breakfast pork chops. It was a big hit with my family. Thank you ma'am I could never get the breading to stick, and using smaller pieces was a brilliant idea. My family thanks you. Will be trying this tonight! I just found you blog and I love it! I'm up in Canada and we don't have any restaurants that make good old CFS, like I've had when I was in the southern US. I'm so happy to have found this recipe and your site. I love comfort food. I'll be continuing to read. I'm kind of late to the party but your post about the CFS just showed up in my FB feed. I can't wait to try it. We love CFS and your spin on it sounds delicious. Who cares what fat or skillet you use to cook it in. Thanks for sharing. Me too with cube steak or round and a pound it good with a meat hammer.